Why are most bodies buried with feet facing east? It’s true. In most cemeteries around the world, the majority of bodies are buried so that their heads lie to the West and their feet to the East. This very old custom may have originated with Pagan sun worshippers who thought that with their feet pointing toward the east the dead will be ready to rise up and be reborn. See the kind of cool stuff authors learn? And you thought it was all spelling and grammar! 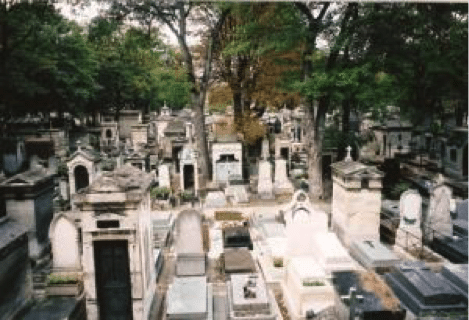 Check out this cemetery in Montmartre, Paris, France.